Creative movement is an enjoyable way for young children to develop their physical skills, channel their energy, stimulate their imagination and promote their creativity. This class will encourage the young child’s need for expression and through creative play. There will be numerous opportunities to practice a broad variety of movement skills such as creeping, running, leaping, twisting, and galloping. Games linked to music, patterning, shape recognition and spatial awareness will support other early learning experiences. This class is also an introduction to parent-free independent learning experiences. This second level of creative movement will build upon the growing intellectual and physical abilities of the older pre-schooler. Movement exploration will be used to enhance other areas of learning such as language arts, pre-math concepts, social relationships, and the arts. More complex improvisational opportunities will provide the child with a growing sense of physical accomplishment and creativity. Ballet is recognized as the foundation of most theatrical dance forms. The theories and practices of the Society of Russian Ballet form the heart of our curriculum. Class material has been carefully developed to ensure a steady, healthy technical and artistic progression from one level to the next. 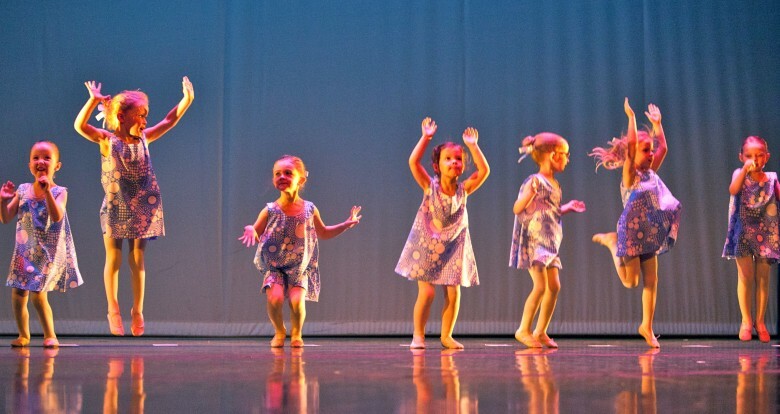 The syllabus is a joy to dance and encourages creativity for students at every stage of their development. Students will be invited to participate in pre-pointe and pointe classes on an individual basis when they have the necessary physical and technical development. Pre-pointe classes will focus on body alignment and strength training for the lower leg and feet. Also included is anatomical instruction and information on how to care for the feet and pointe shoes. At the end of this preparatory year students will be assessed for pointe readiness. Variations class is the study of solo dances from historically established classical ballet repertoire. They were created to highlight the artistic and technical skill of soloists and principal dancers in classical companies. Due to the physical demands of pointe, pointe and variations classes are only open to Intensive Training Program students. If you would like further in formation about pre-pointe training and pointe work readiness please contact the office for our handout. Modern dance and improvisation explores the techniques and concepts of contemporary movement styles that developed in the past century. This class will explore the varied ways to use the torso, floor-work, movements across the floor, and improvisation to create expressive and personal movement innovations. Children’s jazz is composed of a number of popular dance styles accompanied by the strong rhythms and high energy of popular music. This class will reflect a solid balance of technique and styling appropriate for the age of the children. It is highly recommended that this class be supported by ballet study. Upper level jazz and adult jazz classes will explore the many forms of groove and social dancing, and will combine that with classic jazz styling. Groove styles will pull from African, Lindy hop, swing, house, hip hop party dance, salsa, locking and popping, and breaking! Conditioning classes are for dance students, as well as for the those who would like greater mobility, strength and core function for their daily lives. The class will use a variety of strength building methods drawing upon Pilates, yoga, exercise ball work and floor barre. Students will also experience a variety of stretching and mobilizing techniques such as passive and dynamic stretching, PNF (Proprioceptive Neuromuscular Facilitation), body rolling and facial release work. All photos this page by Cathy McKelvey.